The CEO Sony Ericsson said that there was a lot of "smoke" concerning the rumored PlayStation Phone and that means there "must be a fire." 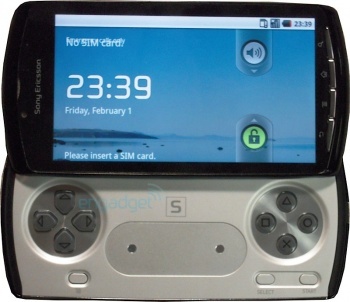 Photos of a rumored Sony phone that could play games first surfaced back in October. At first, leaked the codename, Zeus. The photos showed a phone that was clearly imprinted with Sony Ericsson label, a company jointly held by Sony and Swedish cell phone maker, L.M. Ericsson Telephone Co. Today, Bert Nordberg, CEO of Sony Ericsson, told the Wall Street Journal that all of the rumors surrounding a gaming phone from Sony must mean something. "There's a lot of smoke, and I tell you there must be a fire somewhere," Nordberg said. "Sony has an extremely strong offering in the gaming market, and that's very interesting." Such a device has already been called the PlayStation Phone by many in the press, but the WSJ reports that a source told them that it would most likely bear Ericsson's Xperia brand. I don't know about you, but I'd think that gamers would be more inclined to buy something with a brand more closely associated with gaming. "Hey guys, check out my Xperia phone." "What's that?" "It plays games." "Oh." It seems that Nordberg at least understands that. "Sony is of course a very strong brand, and why shouldn't we use that?" he said. "Gaming, including content, is a very interesting proposition." For him, a gaming-oriented phone only makes sense. He thinks that the current touchscreen phones aren't sufficient gaming platforms, a sentiment with which I'm inclined to agree. But then again, it's important for the phone portion to actually work. Nordberg didn't mention it, but I'm sure the Nokia N-Gage is whispered as a word of caution in Sony's boardrooms. Nobody wants another taco.